Focus your mobile billboard advertising campaign to appear in conjunction with your direct mail promotion. We can give away handouts that support your direct mail ads, or our drivers can conduct product sampling from the mobile billboard truck to complement your ad campaign for a new product. You can also display your mobile billboard truck campaign in conjunction with radio and television ads to increase coverage. Imagine your potential customer hearing your message and then sees your billboard on the interstate in the next lane. 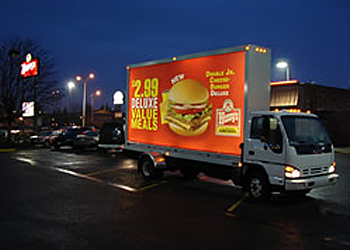 The significant advantage of mobile billboards in Los Angeles and other major cities is that they receive unsurpassed attention, as moving objects are irresistible to the human eye. 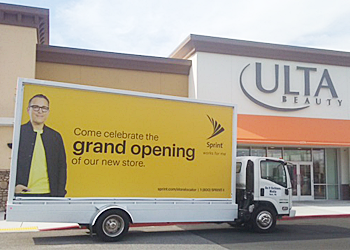 Mobile billboards can bring your advertising message into hard-to-hit locations, and your route is targeted to deliver immediate, overwhelming results. Reach people during their drive to and from work, or reach the growing number of pedestrians who choose sidewalks over highways. 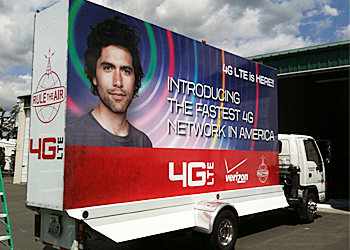 Mobile billboards also let you deliver your message in areas where traditional billboards are unavailable or not allowed. We look forward to helping you reach your customers in new creative ways. Reach out to our team at EYE CATCHING MEDIA by dialing (253) 218-3179 and discuss your advertisement for a mobile billboard truck right now.